Today I have a secret recipe for a yummy tart served at Starbucks. Brown sugar, cinnamon and walnuts are wrapped in a shortbread crust. This pairs perfectly with a hot cup of coffee or tea. Use an electric mixer to cream butter, sugar, and vanilla. In a medium-sized bowl, combine the flour and salt. Gradually incorporate the flour mixture to the butter and sugar; mixing until smooth. Divide the dough in half and shape it into two balls. Wrap each ball in plastic and chill in the refrigerator for 30 minutes. In a medium-sized bowl, combine the confectioners’ sugar, brown sugar, and cinnamon. In a separate bowl, combine the liquid egg white and vanilla; Add the walnuts and toss to coat. Combine the sugar mixture with the walnut mixture and stir until smooth. Roll out one ball of chilled dough onto a floured surface to 1/8 inch thick. Cut the dough into 16 2 x 4 inch rectangles. Place 8 rectangles onto a parchment lined cookie sheet and place 1 tablespoon of filling in the center of each rectangle. 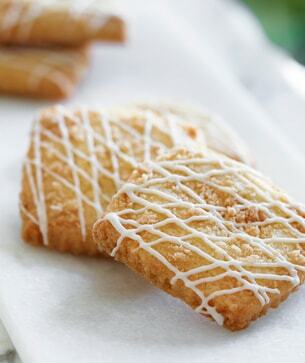 Place a second shortbread rectangle on top of the filling and crimp the edges with the tines of a fork. Poke some holes in the top shortbread crust to allow steam to escape while cooking. Repeat this process with the second ball or dough. Bake the tarts for 8 – 10 minutes, until the edges are lightly brown. Allow the tarts to cool on the cookie sheet for a few minutes before moving them to a cooling rack.